Within the last 72 hours, bitcoin has managed an upward move of more than $300, securing a new Bitstamp daily high of $2,788.89. Current sentiment is somewhat bullish and most medium, small, and micro-cap altcoins seem to be suffering. Volume is picking up nicely despite the increase in price. Premiums have also stabilized accordingly across the board between Bitfinex, Bitstamp, BTC-e, Huobi and Kraken. LakeBTC has a premium that is $100 above the previously mentioned five exchanges while OKCoin is even higher, more than $200 above the majority of competing exchanges. Since Monday’s Bitstamp low of $2,460.51, there has been a rise of more than 13% in price. This is slightly less than the preceding leg up, which was an impressive 26.08% during a similar period of 48 hours. It may be a sign of momentum slowing down, but once again volume appears to holding regardless. 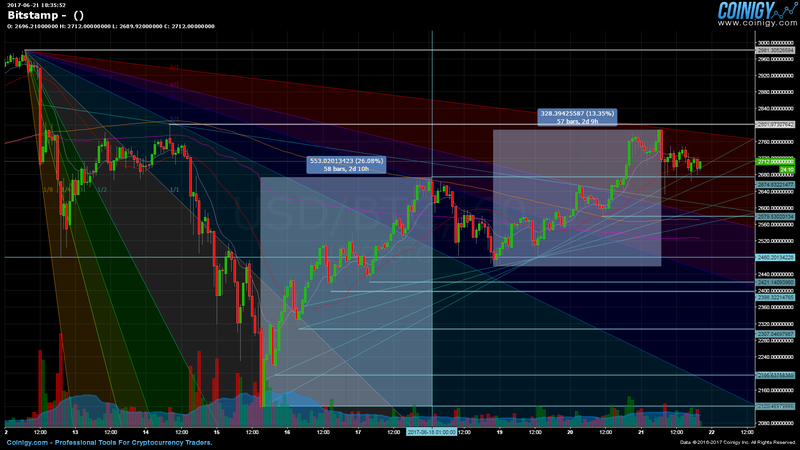 Intersecting trend lines show $2,480.21 as a focal point that may require additional attention. 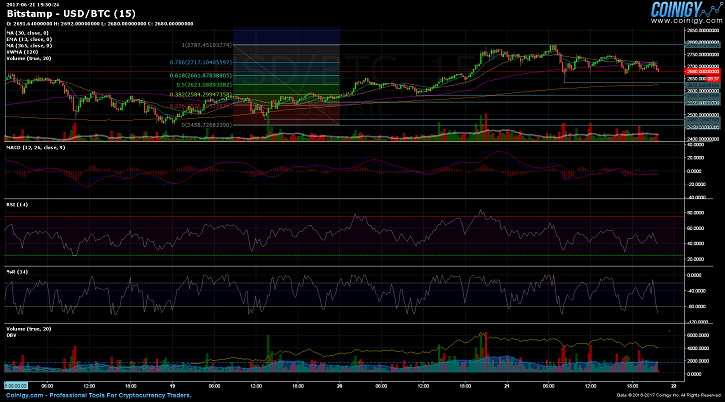 Any dips below this level are in all likelihood going to be a strong signal for the end of the ensuing upward trend. This would of course require a prior shattering of the $2,578.41 price point with a subsequent plunge below $2,421.14, $2,398.32, $2,195.63 support levels and the weekly low of $2,120. The market has seen a steady push past most of the Gann Fan angles and only a breach of the diagonal line at 8/1 is needed for a final drive to the all-time high of $2,980. Fibonacci levels for the current trading range are not lining up exactly with the formerly mentioned support levels. However, the $2,578.41 support seems to be the closest to the Fibonacci 0.382 line. Interestingly, the 1.618 Fibonacci level is just slightly above the $2,980 all-time high. RSI is neutral at the moment with the MACD noticeably tightening movement without appearing overbought or oversold. Substantial divergence is present with the Williams %R indicator, which is rather low at present. OBV is descending steadily with today’s stable trading volume and price movement. Bitcoin started trading on June 18th, at $2,651.37 (GMT 00:00 – Bitstamp) and has since moved in an upward trading range from the Monday daily low of $2,460.51 (GMT 20:00) to today’s new weekly high of $2,801 (GMT 04:00).